::: M O O N P O D games ::: No gimmicks, just gameplay. "More indie gaming goodness from the makers of Starscape." "...it will find an audience, because it has plenty to offer.."
"It's charming in the way that many of Nintendo's titles are.."
"..a great example of what indie gaming is all about." "...this could well be a sleeper hit." Well, we certainly hope that last statement is true ! Movie, games, tv and DVD news/ reviews site Cinema Blend mentions playing Mr. Robot in its gaming news section. "It’s rare that a video game will come out of the wood works and really offer up something new, different, original and unique. 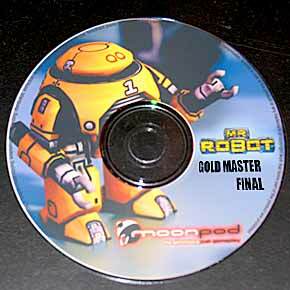 Moonpod, however, has managed to do just that with the release of their new title, Mr. Robot." "The visual aspects of the game are actually pretty snazzy, insofar that the 3D models kind of look like toys. Special effects and battle sequences play out rather spectacularly as well..."
"It’s a really cool concept and a great design that many developers aught to echo when it comes to originality. Maybe in the next-generation of gaming, eh? " over at Third Party Ninjas. "Without a doubt, this is the best indie game I’ve ever played, and I’d be willing to put it on the same level with some of the big budget non-indie games I played this year. Really, I’m not kidding." Moonpod, are proud to announce the release of our new independent game, Mr. Robot, available on PC. Journey through the bowels of a massive starship to save your robot friends and the precious human cargo. Solve puzzles. Overcome obstacles. Hack hostile networks. Evade crazed robots. Save the mission. Mr. Robot is a 3D action-puzzle-adventure-rpg. Inspired by classic filmation games such as Knight Lore and Alien8 and mixed with'Ghost Hack' - an abstract RPG in which the player hacks into computer terminals and battles defensive computer programs. Featuring over 200 rooms, more than 20 different enemies, 7 friendly robots to aid in your quest, numerous medals to unlock and a built in editor so you can create your own adventures. Sheffield-based Moonpod was formed in November 2002 with the mission to take ideas and themes that rocked our game play world and evolve them into the next level. We want to listen to what the gamer wants and create a diverse and challenging array of titles. Moonpod's first game, Starscape, won Gametunnel's coveted 'Game of the Year' award. I think we may be able to disrupt Sony and Nintendo's big launches with this baby! Stuck in mindr5? Possible spoilers.